RedFin have design, built and in some cases, provided ongoing maintenance for some of the most unique, custom built aquariums world wide. From jellyfish aquariums to full corals reef aquarium RedFin’s design team have the knowledge and experience to make your dream aquarium a reality. RedFin also have an aquarium installation team who can provide aquarium installation support word-wide. Brief: Design a large aquarium suitable for keeping a wide range of jellyfish for a luxury private residence in Hong Kong. Brief: Design and build a large acrylic jellyfish aquarium with a viewable window measuring 150cm wide by 200cm tall. A custom built filtration system and LED lighting system designed specifically for jellyfish was also supplied. Brief: Design, build install and provide ongoing maintenance for a 7 meter (23 feet) long reef aquarium containing a range of corals and marine fish. Brief: Design, build and install a large custom acrylic aquarium containing life like artificial coral theming in a luxury Dubai villa. 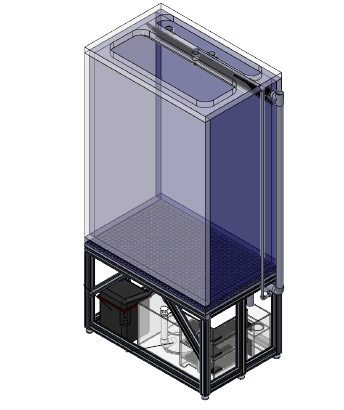 The completed aquariums outer dimensions are 4.5m x 1m x 2.4m high.